Dr. Boyd J. Michael III, has served Washington County students, families, staff and the community for 38 years. As a teacher, coach and educational leader, he has demonstrated a passionate commitment to ensuring students receive optimal opportunities to succeed at the highest levels. As principal of Hancock Middle/Senior High School, Dr. Michael led the school to the prestigious honor of achieving National Blue Ribbon School status. During his tenure as Executive Director of Secondary Schools, he pioneered breakthrough initiatives aimed at reducing the student dropout rate and promoting quality, rigorous instruction in every Washington County middle and high school. His results-driven leadership propelled Washington County Public Schools to statewide recognition as a leader in critical state academic assessments, graduation rates, and student attendance. As Assistant Superintendent for School Operations, and in his most recent role as Deputy Superintendent, he led critical planning, construction and funding efforts for the building and successful opening of eight new schools and the new WCPS administrative headquarters in less than 10 years. In his leadership role as second-in-command for Washington County Public Schools, Dr. Michael was instrumental in the implementation of the one-to-one iPad initiative, making Washington County Public Schools the first Maryland district to achieve an instructional technology plan of this type. Additionally, he has spearheaded a significant portion of the Downtown Revitalization Project for the school system, working alongside local and state officials to secure funding that will expand learning opportunities for students. Among other key responsibilities, Dr. Michael has been on the front line for more than a decade working to secure Capital Improvement Funds for school construction projects. 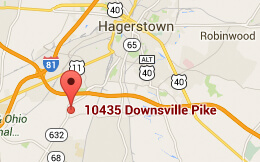 Dr. Michael is a lifetime resident of Washington County and resides near Boonsboro with his wife of 38 years. Their three children attended Washington County public schools and all graduated from Boonsboro High School. Dr. Michael earned his Bachelor’s, Master’s and Doctoral degrees from the University of Maryland. *Dr. Michael was named Interim Superintendent on February 7, 2017, and assumed duties officially on March 14, 2017. He was also named as the next WCPS Superintendent of Schools by the Washington County Board of Education, a position that he began on July 1, 2017.